Curtin University has a burgeoning alumni community and is pleased to offer the Alumni & Family Scholarship 2016 to any nationality except Australian. This scholarship category awards 2016 eligible students 25% of their first year of tuition. Curtin University acknowledges the importance of this group in growing the University and this scholarship aims to foster trust and confidence in Curtin University as a place for students to further their studies, careers and life experiences. Additionally, eligible students who enrol in a Curtin English ELB (English Language Bridging) program before undertaking their study at the University will receive a 10 per cent discount on Curtin English ELB tuition fees. Our office is open from 9:00 am – 4:45 pm, Monday to Friday. 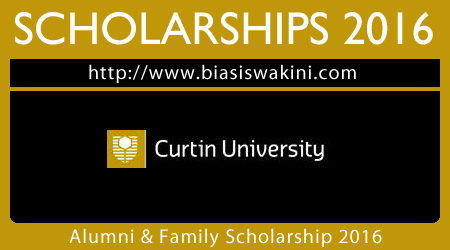 0 Komentar untuk "Curtin University Alumni and Family Scholarship 2016"